With Online Banking you can view account transactions, transfer money between accounts, receive text or e-mail account alerts, make loan or bill payments, and even send money to friends using our popmoneySM service. Account Alerts – Set up email or text alerts and we’ll notify you when specific account activity occurs. ePay Online Bill Pay – Pay your bills online with Heritage Bank ePay, our FREE online bill pay service. 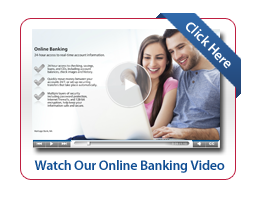 Mobile Banking – Access your account information directly from your mobile device. Money Transfer Options – We have multiple options for securely and electronically transferring money. System Unavailability Customers have the ability to access information about their accounts with Heritage Bank through electronic means (Online Banking, ATMs, etc.). Although Heritage Bank tries to provide accurate and timely information to its customers via electronic means, there may be inadvertent technical occurrences beyond the bank’s control which would cause electronic access to be unavailable. Heritage Bank is not responsible for any losses resulting from the inability of customers to access their accounts and/or perform transactions during any such occurrences. Similarly, Heritage Bank is not responsible for any losses during periods when its electronic systems are shut down for maintenance, repairs, upgrades, or other necessary actions.